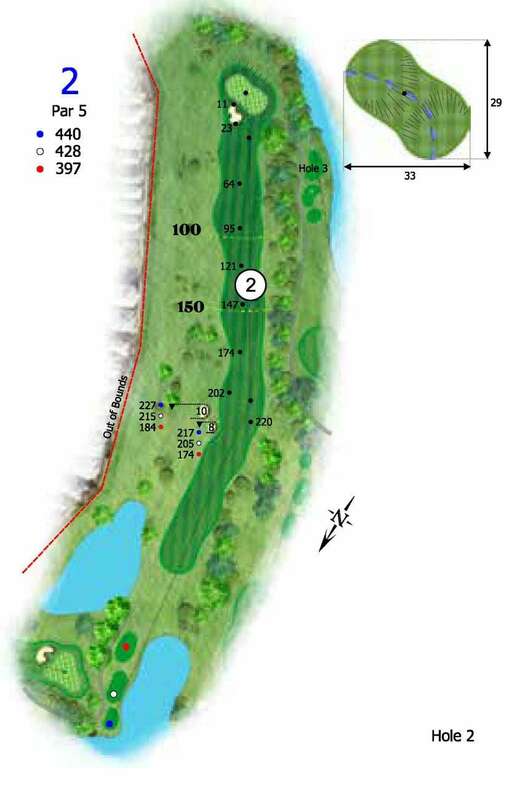 The second hole is a short par 5 with OB on the left for the entire hole. Fairway bunkers will test your confidence and distance off the tee. It is generously open from here to the green. The shot into the green is tight and is guarded by a dominant bunker at the front and grassy slopes around most of the green. Good placement on this hole can set you up for an easy birdie. Safe Play: Take a long iron or utility wood from the tee to avoid the fairway bunkers on the left, from here you can lay up to a wide fairway leaving a short approach to a large green. Aggressive Play: Hit over or right of the fairway bunker with driver, then take aim at the green to set up a chance at eagle.